Due to its excellent properties such as ultraviolet obscuration, chemical stability and small particle size, nano-titanium dioxide (nano-TiO2) is widely used, particularly in sunblock products. The skin is therefore a chief route for exposure. Studies have found that oral or respiratory exposure to nano-TiO2 has an adverse impact on the cardiovascular system. The relationship between dermal exposure to nano-TiO2 and cardiovascular system toxicity, particularly the causative mechanisms, remain unclear. In this study, we used Balb/c mice to evaluate cardiovascular toxicity from nano-TiO2 dermal exposure, and the underlying mechanisms associated with the human umbilical vein endothelial cells (HUVECs) were explored. Our results showed that nano-TiO2 treatment resulted in an obvious increase in reactive oxygen species and 8-hydroxy-2’-deoxyguanosine, indicating the appearance of oxidative stress. Moreover, the levels of inflammatory biomarkers, such as immunoglobulin E, soluble intercellular adhesion molecule-1, interleukin-8, and hypersensitive C-reactive protein, also increased. Exposing HUVECs to nano-TiO2 led to a decline in cell vitality, and an increase in caspase-3 levels, suggesting that nano-TiO2 exposure caused cytotoxicity and even cell apoptosis. Interestingly, neutralizing oxidative stress by administering Vitamin E was shown to reduce the inflammatory response and cytotoxicity. Our findings suggest that nano-TiO2 can injure the cardiovascular system via dermal exposure, and does this via oxidative stress-induced inflammation and cytotoxicity. Vitamin E treatment may be a strategy to mitigate the damage. Nano-titanium dioxide (nano-TiO2) is widely used in the food industry, as well as in the pharmaceutical and chemical engineering fields because of its excellent properties: small particle size; whiteness; and ultraviolet absorption (Mu and Sprando, 2010; Weir et al., 2012; Rehman et al., 2016). It is particularly used in cosmetics, which results in major dermal exposure (Mu and Sprando, 2010). Studies have shown that the proliferation of glial cells (C6 and U373) was restrained by nano-TiO2 (Márquez-Ramírez et al., 2012), and that nano-TiO2 particles induced toxicities in the immune system (Fu et al., 2014), the nervous system (Manixay et al., 2017), the digestive system (Hong et al., 2017), and the respiratory system (Li et al., 2013). Interestingly, Chen et al. (2013) found that ApoE knockout mice exposed to nano-TiO2 particles via tracheal instillation suffered severe systemic inflammation, endothelial dysfunction and lipid metabolism dysfunction, resulting in the development of atherosclerosis, with the implication that nano-TiO2 adversely effects the cardiovascular system. Cardiovascular disease (CVD) is the leading killer in the world (World Health Organization, 2017). In China about 3.5 million people die from cardiovascular disease each year (Chen et al., 2015). It is important to note that the cardiovascular system is one of the major targets of toxicity caused by nanoparticles (Mann et al., 2012). The penetration of nanoparticles through the skin is a controversial topic. There are some studies that show that nanoparticles do not penetrate the skin (Nohynek and Dufour, 2012; Watkinson et al., 2013). But it has been reported that nanoparticles accumulated on the skin could translocate from the lymph to the blood, and then be distributed to various organs (Oberdörster et al., 2005). Menzel et al. (2004) used pig skin to investigate the ability of nano-TiO2, to permeate the dermis, and found that nano-TiO2, 45-150 nm, could enter into the underlying stratum granulosum from the corneum within 8 hr. In 2009, a study found that there was dermal penetration of nano-TiO2 in hairless mice after 60 days of dermal exposure. The nano-TiO2 had reached different tissues and caused diverse pathological changes in several organs such as the heart, brain and spleen (Wu et al., 2009). Thus, we speculate that nano-TiO2 could enter the blood through the dermis, and cause cardiovascular toxicity. There are a limited number of studies exploring the relationship between cardiovascular system toxicity and nano-TiO2 dermal exposure, and the mechanism underlying this relationship remains unclear. For these reasons we undertook this study. Previous studies have demonstrated that oxidative stress and inflammation may contribute to cardiovascular diseases, such as atherogenesis and coronary heart disease (Dzau et al., 2006; Lee et al., 2011). Reactive oxygen species (ROS) play a significant role in the pathogenesis of cardiovascular diseases (Khurana et al., 2013). In addition, nano-TiO2 treatments have been shown to augment the production of ROS (Huang et al., 2015), increase the levels of 8-hydroxy-2’-deoxyguanosine (8-OHdG) and malondialdehyde (Sheng et al., 2013), all of which could indicate the occurrence of oxidative damage. Soluble intercellular adhesion molecule-1 (sICAM-1) is an endothelial adhesion molecule and can be generated from the splicing of membrane-bound intercellular adhesion molecule-1 (ICAM-1) (Hubbard and Rothlein, 2000). High-sensitivity C-reactive protein (hsCRP) is a kind of acute phase protein, and a pentamer of identical polypeptides, which is used to detect low concentrations of C-reactive protein with a high-sensitivity assay. Studies have reported that sICAM-1 and hsCRP, pro-inflammatory biomarkers, can be used to predict the development and progression of cardiovascular diseases (Ridker et al., 2000; Kaptoge et al., 2013). Additionally, apoptosis is considered to be one of the basic mechanisms in cardiovascular diseases (Haunstetter and Izumo, 1998). Numerous epidemiological and animal studies have shown that the nutritional intake of antioxidants and vitamins have a beneficial effect on oxidative stress, and can ameliorate CVD (Miller et al., 2017). Thus, using Vitamin E (Vit E), an antioxidant, to accommodate oxidative stress may be effective in the prevention of CVD. In this paper, to evaluate the effect of nano-TiO2 exposure on the cardiovascular system, we used mice for an in vivo study, and human umbilical vein endothelial cells (HUVECs) for an in vitro study, and analyzed the levels of oxidative stress, the severity of inflammation and the expression of apoptosis. We also used the antioxidant Vit E to explore the molecular mechanism of nano-TiO2-induced cardiovascular toxicity. The study is also an investigation to determine an appropriate protective agent to prevent injury caused by nano-TiO2 to ensure the safe use of nano-TiO2 in daily life. Nano-TiO2 was provided by Hehai Nano-technology Co. Ltd. (Jiangsu, China). Vit E, 2’,7’-dichlorodihydrofluorescein diacetate and dimethyl sulphoxide were purchased from Sigma-Aldrich (St. Louis, MO, USA). Mouse enzyme-linked immunosorbent assay (ELISA) kit for immunoglobulin E (IgE) was obtained from eBioscience (San Diego, CA, USA); Mouse ELISA kit for sICAM-1 and human ELISA kit for hsCRP were bought from BlueGene Biotech Co. Ltd. (Shanghai, China). Human ELISA kits for interleukin-8 (IL-8) and 8-OHdG were provided by Yuanye Biotech Co. Ltd. (Shanghai, China). The human caspase-3 activity assay kit was purchased from Keygenbio (Nanjing, China). All other chemicals used in this study were analytical reagents. The purchased nano-TiO2 with 85-90% purity was characterized by scanning electron microscopy (SEM). The nano-TiO2 particles were dispersed in 0.9% NaCl with 0.5% hydroxypropyl methylcellulose to reach final concentrations of 0, 0.4, 2, 10 and 50 mg/mL which were used for the in vivo study. Concentrations of 0, 0.45, 2.25, 11.25, 56.25 μg/mL were used for the in vitro study. These preparations were placed in an ultrasound processor for 2 hr daily, and also stirred for an hour before use to avoid aggregating of the nanoparticles in solution. Specified pathogen-free class female Balb/c mice, 5-6 weeks old, were purchased from the Experimental Animal Center of Hubei Province (Wuhan, People’s Republic of China) and housed in standard environmental conditions (light, humidity and temperature were controlled at 12 hr, 50%-70%, and 20°C-25°C respectively). Fifty-six mice were randomly divided into 6 groups (n = 7, per group) for exposure as follows: (A) control, (B) 4 mg/kg/day nano-TiO2 (Nano-TiO2 4), (C) 20 mg/kg/day nano-TiO2 (Nano-TiO2 20), (D) 100 mg/kg/day nano-TiO2 (Nano-TiO2 100), (E) 500 mg/kg/day nano-TiO2 (Nano-TiO2 500), (F) 500 mg/kg/day nano-TiO2 combined with 100 mg/kg/day Vit E (Nano-TiO2 500 + Vit E). For this last group, 3 hr after the administration of nano-TiO2 (500 mg/kg/day), the mice were intragastrically given the Vit E (100 mg/kg/day). The mice had a 2 cm × 2 cm area on their backs shaved using a razor, and the exposed skin was exposed to nano-TiO2 once a day. The appropriate amount of nano-TiO2 solution was dripped onto the exposed skin according to the weight of the mice, and was distributed evenly using the tip of the pipette. People are usually exposed to sunblock for 8 hr per day over the summer (about 4 months). But given that mice were exposed to nano-TiO2 for 24 hr per day in this experiment, we exposed the mice to nano-TiO2 for 42 days. After 42 days, the mice were sacrificed. The serum was collected and processed according to the requirements of the tests described below. The experimental protocols were approved by the Office of Scientific Research Management of Central China Normal University (CCNU-IACUC-2016-003). HUVECs were obtained from Wuhan Bioyeargene Biotechnology Co. Ltd. (Wuhan, China). They were cultured in Dulbecco’s modified Eagle’s medium supplemented with 10% fetal calf serum at 37°C in a humidified atmosphere containing 5% CO2. These cells were divided into 6 experimental groups, and 7 wells in each group. These 6 groups were exposed to 0, 0.45, 2.25, 11.25, 56.25 μg/mL nano-TiO2, and 56.25 μg/mL nano-TiO2 combined with 11.25 μg/mL Vit E (Nano-TiO2 56.25 + Vit E) respectively. In a previous study (Montiel-Dávalos et al., 2012), HUVECs were exposed to 10 μg/cm2 nano-TiO2, corresponding to 10 μg/mL nano-TiO2 (Gramowski et al., 2010) to explore any dysfunction and activation of HUVECs induced by nano-TiO2. Considering that the purity of the nano-TiO2 used in the literature is about 1.125 times that used in our experiment, we chose 0, 0.45, 2.25, 11.25, 56.25 μg/mL nano-TiO2 as the concentration gradients. The collected blood sample from the heart was placed in an EP tube for 30 min at room temperature. To obtain the serum, the blood sample was centrifuged at 3000 rpm/min at 25°C for 10 min. The ROS content was detected by measuring the changes of fluorescence intensity of 2’,7’-dichlorofluorescein according to a previously described procedure (Ma et al., 2014). The ROS concentrations were quantified using an FLX800 microplate reader. Determination of the concentrations of IgE, and sICAM-1 in serum was made using the corresponding ELISA kits. The sample was diluted 50-fold before determination of the IgE concentration. After nano-TiO2 administration, the production of ROS in HUVECs was detected by using 2’,7’-dichlorodihydrofluorescein diacetate according to a previously described procedure (Ma et al., 2014). The MTT assay was utilized to detect the effect of nano-TiO2 on cell viability. Briefly: Cells were cultured in a 96-well plate with the nano-TiO2 suspension at concentrations of 0, 0.45, 2.25, 11.25, 56.25 μg/mL, and 56.25 μg/mL nano-TiO2 along with 11.25 μg/mL Vit E for 24 hr. The above cultures was centrifuged and then washed; Next, 10 μL of MTT (5 mg/mL) was added to 90 μL of fresh medium in each well, and incubated for 4 hr; Following this, 100 μL of dimethyl sulphoxide was used to dissolve the MTT on a temperature-controlled shaker at low speed for 10 min; Finally, the microplate reader was used to measure the absorbance at 570 nm and record the OD value for each well. After cultivation with different concentrations of nano-TiO2 for 24 hr, all groups of HUVECs were harvested from the 96-well plate and disrupted by repeated freezing and thawing. Following this, the supernatant was collected after centrifugation. 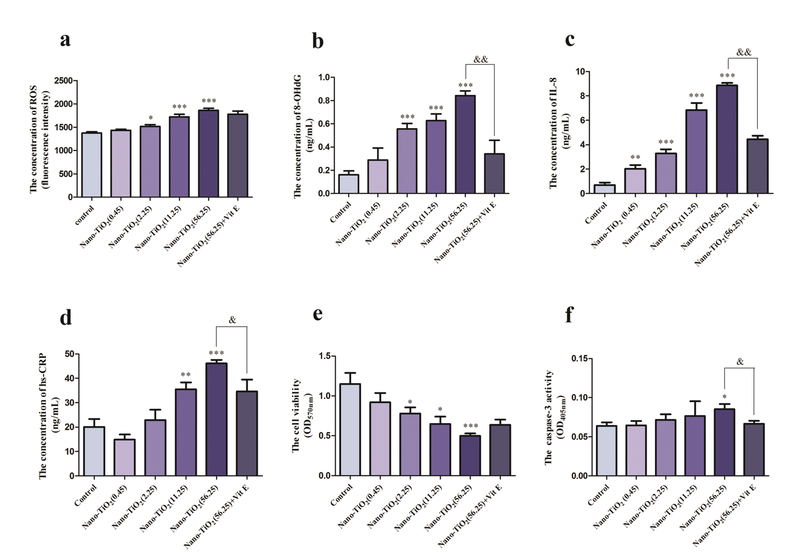 The content of 8-OHdG, IL-8, hsCRP and caspase-3 in the cells were detected using the corresponding ELISA kits according to the manufacturer’s instructions. The statistical graphs were generated using Graph-Pad Prism 5.0 (San Diego, CA, USA). A one-way ANOVA was used to determine the significance of the differences between groups. A p < 0.05 was deemed to be a significant difference, and a p < 0.01 was deemed to be an extremely significant difference. 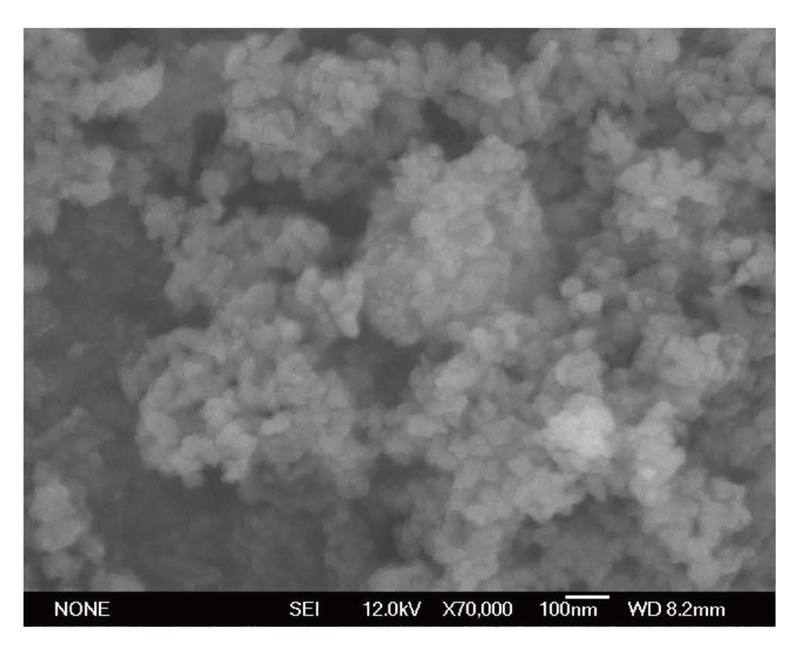 Figure 1 shows the SEM image of the nano-TiO2. Clear lamellar nanostructures can be seen with a grain size of 15-40 nm. The SEM image of nano-TiO2. To evaluate any change in oxidative stress levels induced by nano-TiO2, we looked at the ROS concentrations in the mouse serum. The data presented in Fig. 2a indicates a dose-dependent effect. Although exposure to nano-TiO2 (4 mg/kg/day) did not cause a sharp rise in the ROS level compared with the control group, the administration of 20 mg/kg/day nano-TiO2 induced a significant increase (p < 0.05) and the administration of 100 mg/kg/day (p < 0.01) and 500 mg/kg/day (p < 0.001) nano-TiO2 led to a further significant increase. Nevertheless, compared to the 500 mg/kg/day nano-TiO2 group, a decrease in ROS levels was shown in the 500 mg/kg/day Nano-TiO2 + Vit E exposure group. The changes in oxidative stress and inflammation in mice serum induced by nano-TiO2 dermal exposure. (a) ROS content, (b) The level of IgE and (c) The concentration of sICAM-1. * means p < 0.05, ** means p < 0.01, *** means p < 0.001 compared with the control group; & means p < 0.05 compared with the nano-TiO2 (500) group. To demonstrate whether the inflammation reaction could be induced via dermal exposure to nano-TiO2, we measured the serum IgE levels using ELISA kits. As detailed in Fig. 2b, we discovered that the levels of IgE in the nano-TiO2 20 group, nano-TiO2 100 group and nano-TiO2 500 group (p < 0.01) showed an extremely significant increase, compared with the control group. When comparing the 500 mg/kg/day nano-TiO2 + Vit E group with the 500 mg/kg/day nano-TiO2 group, we found that the presence of Vit E dramatically alleviated the increase in IgE levels caused by exposure to nano-TiO2 (p < 0.05). To further demonstrate the adverse impact of nano-TiO2 dermal exposure on the cardiovascular system, we looked at the levels of sICAM-1. The data were determined by converting the obtained OD value to a concentration according to the standard curve, and they all displayed a dose-response effect as indicated in Fig. 2c. In the Nano-TiO2 4 group, the level of sICAM-1 was obviously higher than that in the control group (p < 0.05). Similarly, compared with the control group an extremely significant increase was observed in the level of sICAM-1 in the Nano-TiO2 20 group (p < 0.01), the Nano-TiO2 100 group (p < 0.001) and the Nano-TiO2 500 (p < 0.001) group. We also found that although there was no obvious difference between 500 mg/kg/day nano-TiO2+Vit E group and the 500 mg/kg/day nano-TiO2 group, the level of sICAM-1 in the Nano-TiO2 500 + Vit E exposure group was lower than the Nano-TiO2 500 group. As mentioned earlier, the level of ROS in HUVECs was measured to evaluate the role of reactive oxygen in nano-TiO2-induced effects. As shown in Fig. 3a, a significant difference in ROS content induced by nano-TiO2 is evident (p < 0.05) when comparing the 2.25 μg/mL nano-TiO2 group with the control group. What is more, there was a very significant elevation in ROS levels in the 11.25 μg/mL and 56.25 μg/mL nano-TiO2 groups (p < 0.001) compared with the control group. It was observed, although the difference was not statistically significant, that the increase in ROS levels was attenuated when Vit E was present, by comparing the nano-TiO2 + Vit E treatment group with the group exposed to nano-TiO2 alone. The adverse effects caused by nano-TiO2 in HUVECs. (a) ROS content, (b) The level of 8-OHdG, (c) The concentration of IL-8, (d) The change in hsCRP, (e) The viability of the cells and (f) The expression of caspase-3. * means p < 0.05, ** means p < 0.01, *** means p < 0.001 compared with the control group; & means p < 0.05, && means p < 0.01 compared with the nano-TiO2 (500) group. The change in 8-OHdG levels in HUVECs is shown in Fig. 3b after 24 hr of exposure to nano-TiO2. There was no obvious elevation seen in the 0.45 μg/mL nano-TiO2 group when compared to the control group, whereas the 8-OHdG content in the 2.25 μg/mL, 11.25 μg/mL, and 56.25 μg/mL nano-TiO2 groups all displayed a very marked increase when compared to the control group (p < 0.001). Moreover, we saw that the level of 8-OHdG decreased very significantly when Vit E was added, when comparing the 56.25 μg/mL nano-TiO2 +Vit E group with the 56.25 μg/mL nano-TiO2 group (p < 0.01). These results suggest that nano-TiO2 exposure might trigger oxidative stress and ultimately cause oxidative stress injury. To identify the effect that nano-TiO2 has on inflammation, we looked at the levels of IL-8 and hsCRP in the HUVECs. After 24-hr nano-TiO2 exposure, the level of IL-8 was measured using the ELISA method (Fig. 3c). We observed a significant difference in the 0.45 μg/mL (p < 0.05) nano-TiO2 group. In addition, the 2.25, 11.25 and 56.25 μg/mL nano-TiO2 groups all demonstrated an extremely significant decrease in IL-8 levels compared with the control group (p < 0.001). However, the levels of IL-8 in the 56.25 μg/mL nano-TiO2 + Vit E group was significantly lower (p < 0.01) than the 56.25 μg/mL nano-TiO2 group. As can be seen from Fig. 3d, when compared with the control group, the 11.25 μg/mL (p < 0.01) and 56.25 μg/mL (p < 0.001) nano-TiO2 groups displayed a very marked increase in hsCRP levels, while the levels of hsCRP in the 0.45 μg/mL and 2.25 μg/mL nano-TiO2 groups did not demonstrate any obvious difference. Interestingly, the hsCRP level of the 56.25 μg/mL nano-TiO2 +Vit E group decreased significantly in comparison to the 56.25 μg/mL nano-TiO2 group (p < 0.05). These results imply that exposing HUVECs to nano-TiO2 can augment the inflammatory reaction. The results of cell viability detected by MTT assay are shown in Fig. 3e. After 24 hr of nano-TiO2 treatment, the cell viability of HUVECs decreased progressively with increasing exposure concentrations of nano-TiO2. More noticeably, the cell viability of the 2.25 μg/mL and 11.25 μg/mL nano-TiO2 groups were markedly lower than for the control group (p < 0.05). The cell viability in the 56.25 μg/mL treatment group was reduced to about 43.5% of the control group (p < 0.01). In other words, the half maximal inhibitory concentration (IC50) of nano-TiO2 for cell viability was less than 56.25 μg/mL. In addition, Vit E treatment seemed to increase slightly the viability of the cells. It was recognized that nano-TiO2 exposure could restrain cell growth in some cases. After the HUVECs were cultivated with nano-TiO2 for 24 hr, the levels of caspase-3 showed a dose-dependent relationship with the elevated nano-TiO2 concentrations. Inspection of Fig. 3f indicated that the 0.45, 2.25 and 11.25 μg/mL nano-TiO2 groups showed a slight upward trend in caspase-3 levels, and that the 56.25 μg/mL nano-TiO2 group showed a marked increase when compared with the control group (P < 0.05). The level of caspase-3 for the 56.25 μg/mL nano-TiO2 +Vit E group declined significantly compared with the 56.25 μg/mL nano-TiO2 group (p < 0.05). It seems very likely that the susceptibility to apoptosis is enhanced with exposure to nano-TiO2. Oxidative stress plays a key role in the progression of CVD (Lee et al., 2011), it occurs when the balance between the formation and elimination of ROS is broken. ROS is the byproduct of normal metabolism, mainly coming from the mitochondrial respiratory chain, nicotinamide adenine dinucleotide phosphate oxidases, and uncoupled nitric oxide synthase (Sugamura and Keaney, 2011). Note that oxidative stress-mediated toxicity of nano-TiO2 has been reported for the following tissues: kidney (Huang et al., 2015); liver (Hong and Zhang, 2016); heart (Sheng et al., 2013); lung (Li et al., 2013); brain (Zhou et al., 2017); as well as in cells (Schanen et al., 2009). Clinical studies have found that the risk of cardiovascular events in patients with coronary artery disease is up-regulated with increased oxidative stress (Heitzer et al., 2001). In our study, the results from the measurement of ROS content in serum and in HUVECs indicated that oxidative damage occurred in the cardiovascular system as a result of nano-TiO2 exposure, which might suggest that nano-TiO2 has an effect on cardiovascular toxicity. In addition, ROS may negatively affect large molecules including DNA, lipids and proteins (Sesti et al., 2010). 8-OHdG, a sensitive oxidative stress biomarker of DNA base lesions, is formed because the 8th position of the nucleobase guanine or its nucleoside guanosine is attacked by ROS (Valavanidis et al., 2009). In our experiment, we posited that nano-TiO2 could cause DNA damage of a cardiovascular endothelial cell because there was an escalating trend in 8-OHdG levels with increasing exposure doses of nano-TiO2. Sheng et al. (2013) found that exposing a mouse heart to nano-TiO2 could dramatically increase the levels of ROS and 8-OHdG. These findings are consistent with our results. IgE plays an important role in allergic reactions and in enhancing acute inflammation, and as such represents the medium in the pathogenesis of cardiovascular disease (Criqui et al., 1987). Studies have found that IgE can be secreted by motivated B cells because of the alternation of T helper type 2 (Th2) cytokines (Ketelhuth and Hansson, 2016), and that ROS could launch Th2 responses via the cooperative interaction between dermal dendritic cells and basophils (Tang et al., 2010). In our work, an increase in IgE in mice serum was seen with an increase in the nano-TiO2 exposure dose, which is consistent with the work described by Park et al. (2009) showing that nano-TiO2 could elevate the production of IgE and cause chronic inflammation. Thus, we may postulate that the increase we saw in the level of IgE in our study was because the ROS-mediated Th2 response could trigger B cells to synthesize IgE. Furthermore, IgE can control the actions of high affinity IgE receptors and Toll-like receptors 4 to increase phosphorylation of extracellular signal-regulated kinase 1/2 (ERK 1/2) and the expression of interleukin-6 (IL-6), which in turn induces vascular cell inflammation and apoptosis, and thus promotes atherogenesis (Wang et al., 2011). Studies have reported that sICAM-1, IL-8 and hsCRP, all inflammatory biomarkers, are involved in the development of CVD (Ridker, 2001; Apostolakis et al., 2009; Gross et al., 2012; Wolf and Lawson, 2012). sICAM-1, IL-8 and hsCRP can promote leukocyte adhesion and trans-endothelial migration to the vascular wall, and may therefore exert effects on arteriosclerosis, plaque angiogenesis and deposition, and cause the infiltration of macrophages and atherosclerotic lesions (Hubbard and Rothlein, 2000; Yousuf et al., 2013; Golia et al., 2014). Also, epidemiological and animal exposure studies have shown that nano-TiO2 can increase the levels of ICAM, IL-8, and hsCRP (Chen et al., 2013; Zhao et al., 2018), findings which are in accordance with our results, even though our research used a different exposure path. Research has indicated that ROS can change the expression of ICAM-1 and IL-8 via activation of the activator protein 1 (Hubbard and Rothlein, 2000) or of the NF- kappaB pathway (Csiszar et al., 2005; Hopkins, 2013). Furthermore, ROS can control levels of hsCRP due to the activation of the ERK1/2 pathway (Singh et al., 2007). In endothelial cells, increased production of IL-8 can be induced by ICAM-1 to enhance leukocyte trafficking (Hubbard and Rothlein, 2000). Due to monocyte recruitment, ICAM-1 could trigger the expression of pro-inflammatory mediators IL-6 (Siti et al., 2015), which may then lead to the production of C-reactive protein with IL-6 stimulation (Gabay and Kushner, 1999). Therefore, in this study, we assumed that ROS induced the increase in sICAM-1, and that the elevated levels of IL-8 and hsCRP we saw may be regulated by both ROS and sICAM-1. Our experiments also assessed the cytotoxicity of nano-TiO2 using cultured HUVECs, a kind of human endothelial cell line. The induced ROS was accompanied by a decline in cell viability, and it therefore seems reasonable to attribute the nano-TiO2-induced HUVECs cytotoxicity to oxidative stress. Moreover, ROS plays a crucial role in the apoptotic process, and can induce apoptosis via two mechanisms (Haunstetter and Izumo, 1998; Simon et al., 2000). One mechanism is to activate death receptors while the other is to act on mitochondria to release cytochrome C. Caspase-3, an important enzyme related to cell apoptosis, is usually activated by cytochrome C release from mitochondria or by the death receptor pathway. Once activated, caspase-3 could trigger chromosome condensation and DNA fragmentation, triggering cell apoptosis. In our experiment, the finding that there was significantly increased caspase-3 activity at 56.25 μg/mL was comparable to the result that 56.25 μg/mL was more than the IC50 of nano-TiO2 for cell viability. The elevation of caspase-3 levels occurred in a dose-dependent manner, suggesting that nano-TiO2 could promote apoptosis in some cases. This result is in accordance with a previous study showing that nano-TiO2 could lead to an increase in ROS and the activation of caspase-3 in BEAS-2B cells (Park et al., 2008). However, the apoptosis caused by nano-TiO2 exposure was inhibited significantly after application of Vit E in our study. Apoptosis is considered to be the pathogenic mechanism in many cardiovascular diseases, including atherosclerosis, acute myocardial infarction and heart failure (Haunstetter and Izumo, 1998). Thus, nano-TiO2 may trigger the cardiovascular toxicity because of the ROS-mediated apoptosis. Several studies (Qin et al., 2018) have shown that Vit E is a strong antioxidant. Vit E has the effect of scavenging free radicals because its phenolic hydroxyl group can donate hydrogen atoms (Lu et al., 2011), and is thus very likely to reduce ROS levels, ameliorate inflammation and control apoptosis. Also, studies have demonstrated that Vit E can trigger an antioxidant pathway, such as the nuclear factor-erythroid 2-related factor 2 (Nrf2) pathway, and provide antioxidant benefits (Zhu et al., 2015). Furthermore, Vit E can play a protective role in cardiovascular health by controlling the levels of adhesion molecules, reducing the activation of monocytes or macrophages, and down-regulating the proliferation of smooth muscle cells (Mocchegiani et al., 2014). In our study, the levels of ROS were relieved by the use of Vit E, although less dramatically than expected. This may be attributed to an insufficient dosage of Vit E entering the blood or eventually the HUVECs. Vit E may be absorbed and metabolized by tissues such as the stomach and intestines before it enters the blood, which may explain the view that the content of Vit E was not enough to significantly block ROS. The DNA lesions caused by nano-TiO2 exposure were significantly inhibited after the administration of Vit E. In addition, the induced oxidative stress was accompanied by decreased levels of IgE, sICAM-1, IL-8, and hsCRP and caspase-3. In our study, the levels of oxidative stress, inflammation and apoptosis were reduced due to the presence of antioxidant Vit E, which might reflect that the cardiovascular toxicity of nano-TiO2 skin exposure may be caused by oxidative stress-induced inflammation and apoptosis. 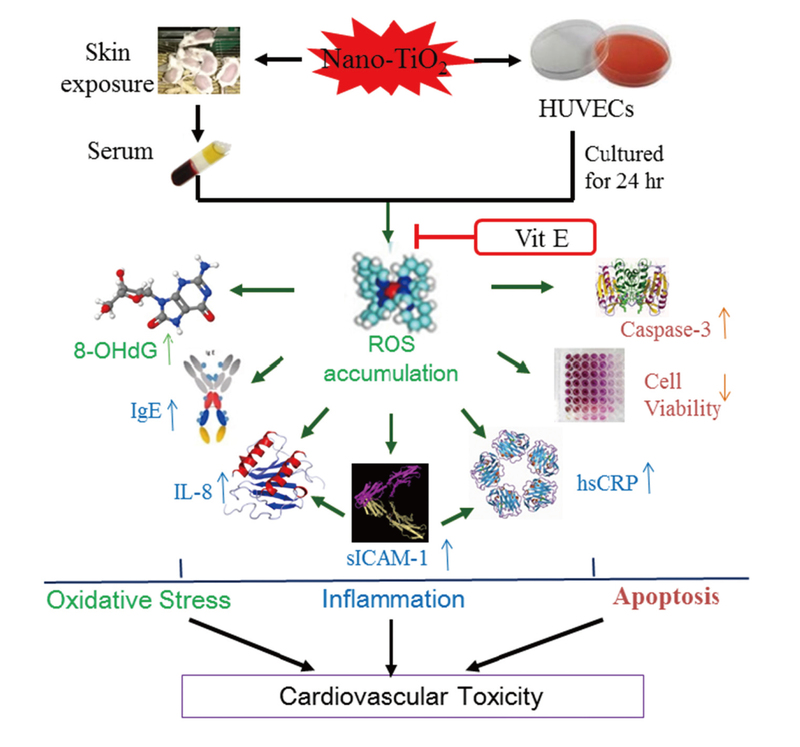 Although we found that nano-TiO2 dermal-exposure had potent toxic effects on the cardiovascular system, such as significant changes in oxidative stress levels in mice and decreased viability of HUVECs, further studies are needed to tease apart the mechanistic effects underlying this cardiovascular toxicity. One study suggested that Vit C combined with Vit E could slow down the progression of cardiovascular disease (Villacorta et al., 2007), so in future experiments we plan to explore the effects of Vit C combined with Vit E on the nano-TiO2-induced cardiovascular toxicity. In brief, we report that dermal-exposure to nano-TiO2 is toxic to the cardiovascular system both in vivo and in vitro. Our results suggest that dermal exposure to nano-TiO2 could cause cardiovascular toxicity at the 100 and 500 mg/kg/day dose in mice, and at the 56.25 μg/mL dose in HUVECs. Oxidative stress, inflammation and apoptosis are potential key factors to reveal the underlying mechanisms of nano-TiO2 dermal-exposure-induced cardiovascular toxicity (Fig. 4). Antioxidant Vit E treatment can attenuate those adverse effects to some extent. This study paves the way for providing effective means to protect humans against dermal exposure to nano-TiO2. Potential mechanism of cardiovascular toxicity caused by nano-TiO2. Nano-TiO2 exposure induced accumulation of ROS, leading to oxidative stress. The oxidative stress was accompanied by some changed marker levels in inflammation and apoptosis, which are related to cardiovascular toxicity. This work was supported by the National Key Research and Development Program of Chain (2017YFC0702700). Apostolakis, S., Vogiatzi, K., Amanatidou, V. and Spandidos, D.A. (2009): Interleukin 8 and cardiovascular disease. Cardiovasc. Res., 84, 353-360. Chen, T., Hu, J., Chen, C., Pu, J., Cui, X. and Jia, G. (2013): Cardiovascular effects of pulmonary exposure to titanium dioxide nanoparticles in ApoE knockout mice. J. Nanosci. Nanotechnol., 13, 3214-3222. Chen, W.W., Gao, R.L., Liu, L.S., Zhu, M.L., Wang, W., Wang, Y.J., Wu, Z.S. and Hu, S.S., (2015): Report on cardiovascular disease in China (2013). Criqui, M.H., Lee, E.R., Hamburger, R.N., Klauber, M.R. and Coughlin, S.S. (1987): IgE and cardiovascular disease. Results from a population-based study. Am. J. Med., 82, 964-968. Csiszar, A., Smith, K.E., Koller, A., Kaley, G., Edwards, J.G. and Ungvari, Z. (2005): Regulation of bone morphogenetic protein-2 expression in endothelial cells: role of nuclear factor-kappaB activation by tumor necrosis factor-alpha, H2O2, and high intravascular pressure. Circulation, 111, 2364-2372. Dzau, V.J., Antman, E.M., Black, H.R., Hayes, D.L., Manson, J.E., Plutzky, J., Popma, J.J. and Stevenson, W. (2006): The cardiovascular disease continuum validated: clinical evidence of improved patient outcomes: part II: Clinical trial evidence (acute coronary syndromes through renal disease) and future directions. Circulation, 114, 2871-2891. Fu, Y., Zhang, Y., Chang, X., Zhang, Y., Ma, S., Sui, J., Yin, L., Pu, Y. and Liang, G. (2014): Systemic immune effects of titanium dioxide nanoparticles after repeated intratracheal instillation in rat. Int. J. Mol. Sci., 15, 6961-6973. Gabay, C. and Kushner, I. (1999): Acute-phase proteins and other systemic responses to inflammation. N. Engl. J. Med., 340, 448-454. Golia, E., Limongelli, G., Natale, F., Fimiani, F., Maddaloni, V., Pariggiano, I., Bianchi, R., Crisci, M., D’Acierno, L., Giordano, R., Di Palma, G., Conte, M., Golino, P., Russo, M.G., Calabrò, R. and Calabrò, P. (2014): Inflammation and cardiovascular disease: from pathogenesis to therapeutic target. Curr. Atheroscler. Rep., 16, 435. Gramowski, A., Flossdorf, J., Bhattacharya, K., Jonas, L., Lantow, M., Rahman, Q., Schiffmann, D., Weiss, D.G. and Dopp, E. (2010): Nanoparticles induce changes of the electrical activity of neuronal networks on microelectrode array neurochips. Environ. Health Perspect., 118, 1363-1369. Gross, M.D., Bielinski, S.J., Suarez-Lopez, J.R., Reiner, A.P., Bailey, K., Thyagarajan, B., Carr, J.J., Duprez, D.A. and Jacobs, D.R. Jr. (2012): Circulating soluble ICAM-1 and subclinical atherosclerosis: The Coronary Artery Risk Development in Young Adults (CARDIA) Study. Clin. Chem., 58, 411-420. Haunstetter, A. and Izumo, S. (1998): Apoptosis: basic mechanisms and implications for cardiovascular disease. Circ. Res., 82, 1111-1129. Heitzer, T., Schlinzig, T., Krohn, K., Meinertz, T. and Münzel, T. (2001): Endothelial dysfunction, oxidative stress, and risk of cardiovascular events in patients with coronary artery disease. Circulation, 104, 2673-2678. Hong, F., Wu, N., Zhou, Y., Ji, L., Chen, T. and Wang, L. (2017): Gastric toxicity involving alterations of gastritis-related protein expression in mice following long-term exposure to nano TiO2. Food Res. Int., 95, 38-45. Hong, J. and Zhang, Y.Q. (2016): Murine liver damage caused by exposure to nano-titanium dioxide. Nanotechnology, 27, 112001. Hopkins, P.N. (2013): Molecular biology of atherosclerosis. Physiol. Rev., 93, 1317-1542. Huang, K.T., Wu, C.T., Huang, K.H., Lin, W.C., Chen, C.M., Guan, S.S., Chiang, C.K. and Liu, S.H. (2015): Titanium nanoparticle inhalation induces renal fibrosis in mice via an oxidative stress upregulated transforming growth factor-β pathway. Chem. Res. Toxicol., 28, 354-364. Hubbard, A.K. and Rothlein, R. (2000): Intercellular adhesion molecule-1 (ICAM-1) expression and cell signaling cascades. Free Radic. Biol. Med., 28, 1379-1386. Kaptoge, S., Thompson, S.G. and Danesh, J.; Emerging Risk Factors Collaboration. (2013): C-reactive protein, fibrinogen, and cardiovascular risk. N. Engl. J. Med., 368, 85-86. Ketelhuth, D.F. and Hansson, G.K. (2016): Adaptive Response of T and B Cells in Atherosclerosis. Circ. Res., 118, 668-678. Khurana, S., Piche, M., Hollingsworth, A., Venkataraman, K. and Tai, T.C. (2013): Oxidative stress and cardiovascular health: therapeutic potential of polyphenols. Can. J. Physiol. Pharmacol., 91, 198-212. Lee, S., Park, Y., Zuidema, M.Y., Hannink, M. and Zhang, C. (2011): Effects of interventions on oxidative stress and inflammation of cardiovascular diseases. World J. Cardiol., 3, 18-24. Li, B., Ze, Y., Sun, Q., Zhang, T., Sang, X., Cui, Y., Wang, X., Gui, S., Tan, D., Zhu, M., Zhao, X., Sheng, L., Wang, L., Hong, F. and Tang, M. (2013): Molecular mechanisms of nanosized titanium dioxide-induced pulmonary injury in mice. PLoS One, 8, e55563. Lu, R., Kallenborn-Gerhardt, W., Geisslinger, G. and Schmidtko, A. (2011): Additive antinociceptive effects of a combination of vitamin C and vitamin E after peripheral nerve injury. PLoS One, 6, e29240. Ma, P., Yan, B., Zeng, Q., Liu, X., Wu, Y., Jiao, M., Liu, C., Wu, J. and Yang, X. (2014): Oral exposure of Kunming mice to diisononyl phthalate induces hepatic and renal tissue injury through the accumulation of ROS. Protective effect of melatonin. Food Chem. Toxicol., 68, 247-256. Manixay, S., Delaby, S., Gaie-Levrel, F., Wiart, M., Motzkus, C. and Bencsik, A. (2017): In vivo evaluation of the potential neurotoxicity of aerosols released from mechanical stress of nano-TiO2 additived paints in mice chronically exposed by inhalation. J. Phys. Conf. Ser., 838, 012025. Mann, E.E., Thompson, L.C., Shannahan, J.H. and Wingard, C.J. (2012): Changes in cardiopulmonary function induced by nanoparticles. Wiley Interdiscip. Rev. Nanomed. Nanobiotechnol., 4, 691-702. Márquez-Ramírez, S.G., Delgado-Buenrostro, N.L., Chirino, Y.I., Iglesias, G.G. and López-Marure, R. (2012): Titanium dioxide nanoparticles inhibit proliferation and induce morphological changes and apoptosis in glial cells. Toxicology, 302, 146-156. Menzel, F., Reinert, T., Vogt, J. and Butz, T. (2004): Investigations of percutaneous uptake of ultrafine TiO 2 particles at the high energy ion nanoprobe LIPSION. Nucl. Instrum. Methods Phys. Res., 219, 82-86. Miller, V., Mente, A., Dehghan, M., Rangarajan, S., Zhang, X., Swaminathan, S., Dagenais, G., Gupta, R., Mohan, V., Lear, S., Bangdiwala, S.I., Schutte, A.E., Wentzel-Viljoen, E., Avezum, A., Altuntas, Y., Yusoff, K., Ismail, N., Peer, N., Chifamba, J., Diaz, R., Rahman, O., Mohammadifard, N., Lana, F., Zatonska, K., Wielgosz, A., Yusufali, A., Iqbal, R., Lopez-Jaramillo, P., Khatib, R., Rosengren, A., Kutty, V.R., Li, W., Liu, J., Liu, X., Yin, L., Teo, K., Anand, S. and Yusuf, S.; Prospective Urban Rural Epidemiology (PURE) study investigators. (2017): Fruit, vegetable, and legume intake, and cardiovascular disease and deaths in 18 countries (PURE): a prospective cohort study. Lancet, 390, 2037-2049. Mocchegiani, E., Costarelli, L., Giacconi, R., Malavolta, M., Basso, A., Piacenza, F., Ostan, R., Cevenini, E., Gonos, E.S., Franceschi, C. and Monti, D. (2014): Vitamin E-gene interactions in aging and inflammatory age-related diseases: implications for treatment. A systematic review. Ageing Res. Rev., 14, 81-101. Montiel-Dávalos, A., Ventura-Gallegos, J.L., Alfaro-Moreno, E., Soria-Castro, E., García-Latorre, E., Cabañas-Moreno, J.G., del Pilar Ramos-Godinez, M. and López-Marure, R. (2012): TiO2 nanoparticles induce dysfunction and activation of human endothelial cells. Chem. Res. Toxicol., 25, 920-930. Mu, L. and Sprando, R.L. (2010): Application of nanotechnology in cosmetics. Pharm. Res., 27, 1746-1749. Nohynek, G.J. and Dufour, E.K. (2012): Nano-sized cosmetic formulations or solid nanoparticles in sunscreens: a risk to human health? Arch. Toxicol., 86, 1063-1075. Oberdörster, G., Oberdörster, E. and Oberdörster, J. (2005): Nanotoxicology: an emerging discipline evolving from studies of ultrafine particles. Environ. Health Perspect., 113, 823-839. Park, E.J., Yi, J., Chung, K.H., Ryu, D.Y., Choi, J. and Park, K. (2008): Oxidative stress and apoptosis induced by titanium dioxide nanoparticles in cultured BEAS-2B cells. Toxicol. Lett., 180, 222-229. Park, E.J., Yoon, J., Choi, K., Yi, J. and Park, K. (2009): Induction of chronic inflammation in mice treated with titanium dioxide nanoparticles by intratracheal instillation. Toxicology, 260, 37-46. Qin, W., Deng, T., Cui, H., Zhang, Q., Liu, X., Yang, X. and Chen, M. (2018): Exposure to diisodecyl phthalate exacerbated Th2 and Th17-mediated asthma through aggravating oxidative stress and the activation of p38 MAPK. Food Chem. Toxicol., 114, 78-87. Rehman, F.U., Zhao, C., Jiang, H. and Wang, X. (2016): Biomedical applications of nano-titania in theranostics and photodynamic therapy. Biomater. Sci., 4, 40-54. Ridker, P.M. (2001): High-sensitivity C-reactive protein: potential adjunct for global risk assessment in the primary prevention of cardiovascular disease. Circulation, 103, 1813-1818. Ridker, P.M., Hennekens, C.H., Buring, J.E. and Rifai, N. (2000): C-reactive protein and other markers of inflammation in the prediction of cardiovascular disease in women. N. Engl. J. Med., 342, 836-843. Schanen, B.C., Karakoti, A.S., Seal, S., Drake, D.R. 3rd, Warren, W.L. and Self, W.T. (2009): Exposure to titanium dioxide nanomaterials provokes inflammation of an in vitro human immune construct. ACS Nano, 3, 2523-2532. Sesti, F., Liu, S. and Cai, S.Q. (2010): Oxidation of potassium channels by ROS: a general mechanism of aging and neurodegeneration? Trends Cell Biol., 20, 45-51. Sheng, L., Wang, X., Sang, X., Ze, Y., Zhao, X., Liu, D., Gui, S., Sun, Q., Cheng, J., Cheng, Z., Hu, R., Wang, L. and Hong, F. (2013): Cardiac oxidative damage in mice following exposure to nanoparticulate titanium dioxide. J. Biomed. Mater. Res. A, 101, 3238-3246. Simon, H.U., Haj-Yehia, A. and Levi-Schaffer, F. (2000): Role of reactive oxygen species (ROS) in apoptosis induction. Apoptosis, 5, 415-418. Singh, P., Hoffmann, M., Wolk, R., Shamsuzzaman, A.S. and Somers, V.K. (2007): Leptin induces C-reactive protein expression in vascular endothelial cells. Arterioscler. Thromb. Vasc. Biol., 27, e302-e307. Siti, H.N., Kamisah, Y. and Kamsiah, J. (2015): The role of oxidative stress, antioxidants and vascular inflammation in cardiovascular disease (a review). Vascul. Pharmacol., 71, 40-56. Sugamura, K. and Keaney, J.F. Jr. (2011): Reactive oxygen species in cardiovascular disease. Free Radic. Biol. Med., 51, 978-992. Tang, H., Cao, W., Kasturi, S.P., Ravindran, R., Nakaya, H.I., Kundu, K., Murthy, N., Kepler, T.B., Malissen, B. and Pulendran, B. (2010): The T helper type 2 response to cysteine proteases requires dendritic cell-basophil cooperation via ROS-mediated signaling. Nat. Immunol., 11, 608-617. Valavanidis, A., Vlachogianni, T. and Fiotakis, C. (2009): 8-hydroxy-2′ -deoxyguanosine (8-OHdG): A critical biomarker of oxidative stress and carcinogenesis. J. Environ. Sci. Health C Environ. Carcinog. Ecotoxicol. Rev., 27, 120-139. Villacorta, L., Azzi, A. and Zingg, J.-M. (2007): Regulatory role of vitamins E and C on extracellular matrix components of the vascular system. Mol. Aspects Med., 28, 507-537. Wang, J., Cheng, X., Xiang, M.X., Alanne-Kinnunen, M., Wang, J.A., Chen, H., He, A., Sun, X., Lin, Y., Tang, T.T., Tu, X., Sjöberg, S., Sukhova, G.K., Liao, Y.H., Conrad, D.H., Yu, L., Kawakami, T., Kovanen, P.T., Libby, P. and Shi, G.P. (2011): IgE stimulates human and mouse arterial cell apoptosis and cytokine expression and promotes atherogenesis in Apoe-/- mice. J. Clin. Invest., 121, 3564-3577. Watkinson, A.C., Bunge, A.L., Hadgraft, J. and Lane, M.E. (2013): Nanoparticles do not penetrate human skin--a theoretical perspective. Pharm. Res., 30, 1943-1946. Weir, A., Westerhoff, P., Fabricius, L., Hristovski, K. and von Goetz, N. (2012): Titanium dioxide nanoparticles in food and personal care products. Environ. Sci. Technol., 46, 2242-2250.
WHO (World Health Organization) (2017): World Heart Day 2017 Scale up prevention of heart attack and stroke. Wolf, S.I. and Lawson, C. (2012): ICAM-1: Contribution to Vascular Inflammation and Early Atherosclerosis. In: Coronary Artery Disease – New Insights and Novel Approaches (Angelo, S., ed. ), pp. 65-90, Intech, Croatia. Wu, J., Liu, W., Xue, C., Zhou, S., Lan, F., Bi, L., Xu, H., Yang, X. and Zeng, F.D. (2009): Toxicity and penetration of TiO2 nanoparticles in hairless mice and porcine skin after subchronic dermal exposure. Toxicol. Lett., 191, 1-8. Yousuf, O., Mohanty, B.D., Martin, S.S., Joshi, P.H., Blaha, M.J., Nasir, K., Blumenthal, R.S. and Budoff, M.J. (2013): High-sensitivity C-reactive protein and cardiovascular disease: a resolute belief or an elusive link? J. Am. Coll. Cardiol., 62, 397-408. Zhao, L., Zhu, Y., Chen, Z., Xu, H., Zhou, J., Tang, S., Xu, Z., Kong, F., Li, X., Zhang, Y., Li, X., Zhang, J. and Jia, G. (2018): Cardiopulmonary effects induced by occupational exposure to titanium dioxide nanoparticles. Nanotoxicology, 12, 169-184. Zhou, Y., Hong, F., Tian, Y., Zhao, X., Hong, J., Ze, Y. and Wang, L. (2017): Nanoparticulate titanium dioxide-inhibited dendritic development is involved in apoptosis and autophagy of hippocampal neurons in offspring mice. Toxicol. Res. (Camb. ), 6, 889-901. Zhu, Y., Li, J., Wu, Z., Lu, Y., You, H., Li, R., Li, B., Yang, X. and Duan, L. (2015): Acute exposure of ozone induced pulmonary injury and the protective role of vitamin E through the Nrf2 pathway in Balb/c mice. Toxicol. Res. (Camb. ), 5, 268-277.